GX6650, le GPU de PowerVR pouvant concurrencer le TEGRA K1 ? Le MWC est l'occasion, dans le domaine de l'informatique, de se focaliser sur le monde de l'ultra mobilité et notamment des smartphones et tablettes. Si cela ne plait pas à tout le monde, on peut au moins apprécier la forte concurrence dans ce secteur qui oblige chaque acteur à repousser ses limites. Imagination Technologie profite donc de cette messe de l'ultra mobilité pour dévoiler un peu plus de détails sur son GPU PowerVR GX6650 qui remplacera l'actuel G6430 qu'on retrouve notamment dans l'iPhone 5S et l'iPad Air. Au compteur,on retrouve 192 cores (192 FP32 ALU et 384 FP32 FLOP pour être plus précis) soit le même nombre que le Tegra K1 récemment dévoilé par NVIDIA. Le GPU possède 12 ROP et 12 TMU à comparer au Tegra K1 qui en possède, respectivement, 4 et 8. Au final, cela permet au GX6650 d'atteindre 115.2 GFLOPS à 300 MHz, comme son concurrent de chez NVIDIA. Alors bien sûr tous ces chiffres sont beaux et il manque quelques détails et surtout des tests grandeurs nature pour se faire un avis. Mais quand on compare aux 76.8 GFLOPS de l'actuel G6430 qui est déjà bon, on se dit que l'année 2014 va être intéressante pour le secteur de l'ultra mobilité. Il faut bien qu'on se console comme on peut, même si on n'oublie pas le PC. Pour ceux qui seraient intéressés par découvrir plus en profondeur la belle architecture Rogue Series 6XT, nos confrères de chez Anandtech ont (presque) fait le tour de la question. Ryan touched on this in his excellent deep dive on Imagination's PowerVR Series 6XT GPU architecture earlier today, but I wanted to specifically call out the new high-end from IMG that was announced back in January. Pictured above is a high-level block diagram of the new PowerVR GX6650, this is IMG's answer to NVIDIA's mobile Kepler/Tegra K1. I tossed in the Series 6 PowerVR G6430 as a comparison point. The G6430 is the GPU in the iPad Air/iPad mini with Retina Display/iPhone 5s. If Apple decides to go all out with a GPU upgrade on its next-generation iPad Air (A8/A8X silicon perhaps? ), the GX6650 would likely be the IP to use. Another major advantage of our PowerVR GX6650 GPU is its massive pixel throughput rate. It is able to process 12 pixels per clock, which is up to triple the number of our competitors. Pixel throughput is a metric which tends to be overlooked in favor of GFLOPS but is equally important when thinking about high resolution displays. Since PowerVR GX6650 is aimed at processors targeting high-end, high-resolution tablets or 4K smart TVs, pixel throughput becomes a hot topic, especially when you have FPS-heavy gaming or complex user interfaces. Add to that the fact that PowerVR GX6650 has an up to 50% higher texture rate compared to its direct competitors, and you quickly begin to understand that the front-end of PowerVR Series6XT GPUs is a beast. Now that we’ve answered your performance-related questions, let’s look more closely at probably the biggest factor which influences mobile graphics: power consumption. 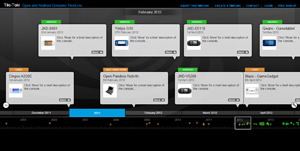 When it comes to power efficiency, PowerVR is and has always been ahead of the pack. PowerVR GX6650 includes all the latest power-saving technologies from Imagination, including PVR3C and PowerGearing G6XT. PowerGearing G6XT is a set of power management mechanisms that lead to sustained performance within fixed power and thermal envelopes. 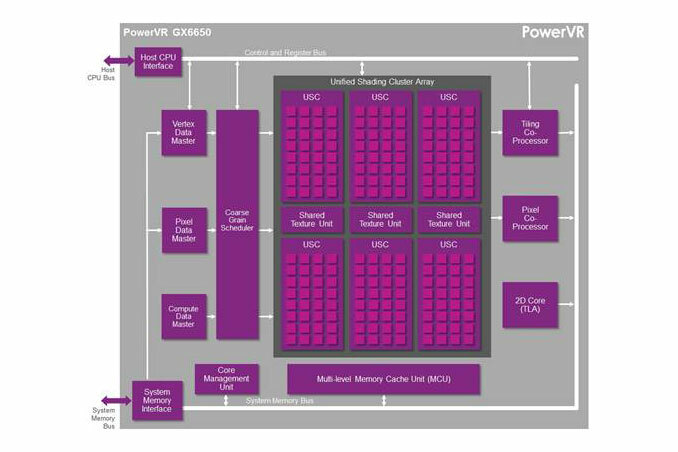 PowerGearing for PowerVR GX6650 enables us to control all GPU resources, allowing dynamic and demand-based scheduling of the six shading clusters and other processing blocks. PVR3C is a suite of triple compression formats that includes PVRTC and ASTC for texture compression, PVRIC for frame buffer compression and PVRGC geometry compression. Whereas competing solutions have only started implementing these concepts, PowerVR GX6650 implements our second generation PVR3C solutions, with optimized algorithms for all of the use cases that matter in mobile (gaming, web browsing, UIs and many more). The mobile industry has little in common with the desktop market which explains why desktop-class, brute-force GPUs have always been, at best, a niche solution. The same consideration applies to proprietary APIs which can be popular as niche solutions on desktops but are not the way forward in mobile, which has thrived on standards like OpenGL ES and OpenCL EP. There is a reason why Khronos has created desktop and embedded profiles for both graphics and compute; it allows GPU companies to create solutions that are optimized for those specific markets and their specific requirements. It is true that you can offer various extensions through which you can enable certain unique features – this is something we’ve done very successfully over the years; but, fundamentally, if you are targeting mobile devices, you want to make sure your GPU is optimized for the right use cases and fully supports mobile API standards. Success in mobile is not just a question of attaching the biggest number to one metric of a GPU: it requires a balanced approach which delivers a blend of performance, efficiency and features. PowerVR GX6650 offers uncompromised support for OpenGL ES 3.0, OpenCL 1.2 EP, Direct3D 11 Levels 9_3/10_0, OpenGL 3.x, OpenCL, and Renderscript, plus future-proofing for upcoming mobile APIs but without the burden of advanced desktop features which cannot be used because no mobile API exists to expose them to developers. In conclusion, PowerVR GX6650 shows that our TBDR graphics architecture is still the leader and is set to remain in that position for the long term.